I had to take a trip to Frome yesterday. I was checking out the exhibiting possibilities at Black Swan Arts for the other half of my practice (see www.stephenrileyart.com). But Frome is also a fine place for photography and I always take my camera along when visiting. The town has some great architecture. It might lack the scale of some of what one sees in England’s bigger towns and great cities. Nevertheless, there are some unique structures with their own fascinating presence. It was a grey, rainy day, so those kinds of photographs where that yellow sandstone sings in the sunlight were not possible, but rainy days create their own kinds of opportunity and bring a different, more moody atmosphere. This building is now the local museum. It was originally erected in 1865 as the town’s Literary and Scientific Institute; a reflection of that Victorian impulse to learn and improve. Its unusual shape is clearly the outcome of the need to fit onto an unusually shaped plot in the tight space between two roads, which further complicated the architect’s challenge by being at different levels. 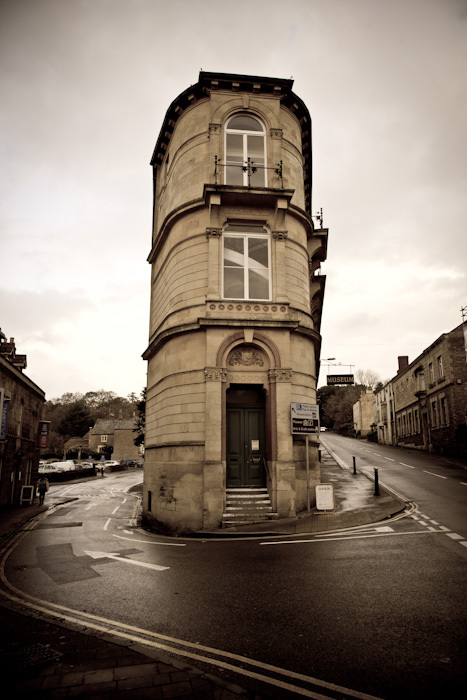 The predicament and resulting shape have echoes of New York’s famous Flat Iron Building (which I have also photographed: click thru), except, of course, that the Frome adaptation is much smaller and the proportions even tighter. So tight, indeed, that photographed from the end, as it is here, the sides vanish and it could almost be taken as a tower. I could have photographed it differently. Many of the online shots show a bit of one or other side, to give a better sense of how the building is, but I enjoyed meeting it at precisely the angle where the sides disappeared, to produce this narrow, teetering quality. In the wet moody light of the day, it seems to have an almost ominous presence.